A few days back, a tattoo (which you’ll see in the featured image) went viral on social media. 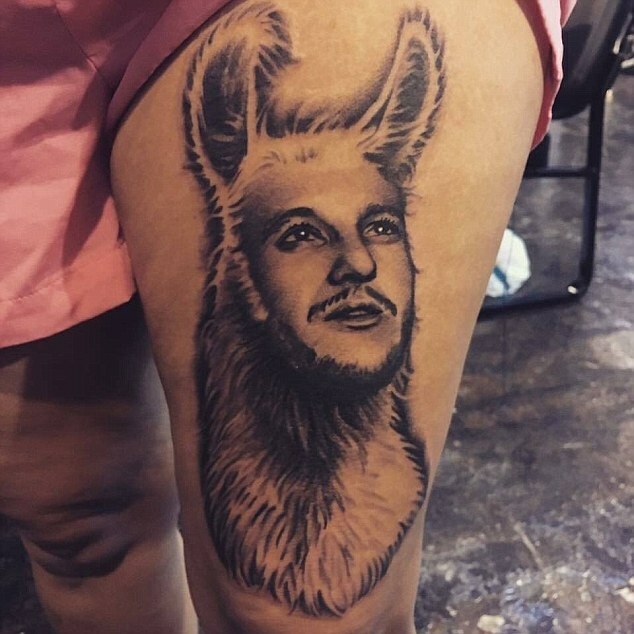 An unknown Liverpool fan got an ‘Adam Lallama’ done on her thigh, much to the amusement of fans everywhere. But it turns out the piece is actually a tribute to a friend who passed away and comes with a really nice back-story. After we initially published a piece on the tattoo, Andreah De La Hoz, who lives in Nashville, Tennessee, got in touch – alerting us that she’s actually a woman (sorry!) – and that she’d be happy to tell us how ‘Adam Lallama’ came about. It’s a tribute to a friend who sadly passed away in 2014 and we think the idea is absolutely brilliant. I got the tattoo here in Nashville, TN where I live. I got it done on Monday, (Feb 6), but I’ve been on the waitlist for a while to have it worked on. “Why Adam Lallama” and “why did I get the tattoo” kind of go hand-in-hand. I was living in KY a few years ago and I made a friend in college named Paige. I introduced her to Liverpool and she became a fan as well. When we signed Adam Lallana, Paige really took a liking to him and he became her favourite. To kind of bug her a bit, I used to call him “Adam Lallama”— she would get annoyed, but it always made her smile. In 2014, my friend Paige passed away due to illness. After a couple of years, I thought, “I’ll get a tattoo as a tribute to Paige”, but I couldn’t decide on what to get. I moved to Nashville in 2015, and joined the local supporters group here for Liverpool (The Nashville Kop). While I was at the pub one day watching a match, Adam had done something “Player of the Year”-ish and I thought of “Adam Lallama”. It made me smile remembering. I was sad that Paige was gone, but happy I had that memory. That’s why I decided to get the tattoo. I asked my fellow supporters what’d they’d think if I got an “Adam Lallama” and they all loved the idea too. People that I know personally have all loved it and thought it was brilliant. The internet is a completely different story. It seems to be about a 50/50 split of positive and negative comments. I’ve been trying to avoid reading about it too much. There’s the usual mean comments–body shaming, people being negative–but then there’s also the people that have said I made their day or made them laugh, or that now want llama tattoos, haha. Honestly, when I look at it, it makes me smile. I think of my friend Paige and I think she’d get a kick out of it. My fiancé laughs every time he sees it, so it makes him happy. My friends all love it, and Adam Lallana himself laughed and approved, so I am perfectly happy with it too. As far as the viral thing, it’s kind of nuts. I just got a tattoo and went to bed thinking nothing of it. Boy, was I wrong. Fortunately, he’s signed a new contract! So I’ll be good until 2021! But really, as long as he doesn’t move to United I’m ok with it. I’d hate to see him go, but that’s the nature of the sport. Because I have a personal reason for getting the tattoo, other than it’s hilarious and I love Adam Lallana, it wouldn’t affect how I feel about the tattoo too much if he decided to move on. I have 5 other tattoos, but none that are Liverpool. I’ve always wanted a Liverpool tattoo, but I wanted it to be unique. I guess I killed two birds with one stone on that one. People have been suggesting other puns for players. If I like one well enough, I might go under the needle again. Personally, I love the St. Joe, Joe Allen as “Christ”, image that was floating around and I might have to go ahead and get him on the other thigh, haha. Thank you for taking the time and wanting to hear my story. I really appreciate it.